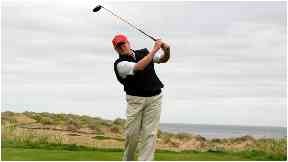 The US President's firm wants to build 550 homes near its golf course in Aberdeenshire. 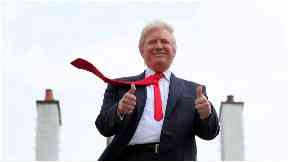 Donald Trump's property firm faces a £5m council bill after it failed to include any affordable homes in plans for a new luxury housing estate. The US President's company applied to Aberdeenshire Council for permission to build 550 homes near its 18-hole golf course, costing up to £1.32m each. The authority has a policy that all new housing projects must include affordable properties - homes with 20% off - and Trump's company hasn't planned for any. Council housing workers have said they still support the plan - but want to bill him £5m, unless he adds affordable homes. In a report published this week, Anne Anderson, council development officer, said: "The Housing Service support the proposed application. "There is housing need in Balmedie as supported by the Aberdeenshire Council waiting list 2019 and the Housing Need and Demand Assessment 2017. "In accordance with the Affordable Housing Policy the Housing Service are seeking to secure a 25% affordable housing contribution in the form of a commuted payment." The council's affordable homes policy means that all housing developers must make at least 25% of their homes affordable. Cash in lieu is only allowed in "rare and exceptional circumstances", the council said. It comes after thousands of locals raised objections last year about the lack of affordable home and access, and parking issues. A 19,000-strong petition was also set up by campaign group TrippingUpTrump which has been presented to Aberdeenshire Council. Campaign group 38 Degrees also submitted 3026 official letters of objection. According to the plans, the homes will have between two and five bedrooms, and be a mix of cottages, townhouses, and mansions. The properties would be individually named, with proposed titles such as Balmoral, Ythan, Forvie, and Leighton, and cost between £295,000 and £1.32m. Documents on the planning website reveal Trump Organisation planned to include 27 workers apartments in the build, and it considered those to be affordable housing. But Aberdeenshire Council said it had not been given enough information to confirm that these workers homes would count toward the quota. Martin Ford, green party councillor for East Garioch, who has spoken out against the Trump Golf Course Resort, said: "Mr Trump's destructive antisocial behaviour, environmental vandalism and made-up claims have got to be challenged - silence is effectively acceptance. "It's a stupid place to put housing. "You put housing where they have access to schools, public facilities and public transport - not in a green field sat where everybody's car dependent." The housing plans are due to go before the full council for approval or rejection next month. The Trump Organisation has not yet responded to a request for comment.